In the spring of 1978, Joseph Phelps Vineyards released its 1974 Insignia, becoming the first California winery to produce a blend of traditional Bordeaux varietals under a proprietary name. 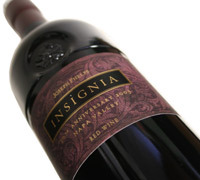 The Napa Valley winery released the 2003 Insignia, marking the 30th vintage of this highly acclaimed series. The 2003 Insignia is layered with aromas of blackberries, black cherries, anise, dark chocolate and coffee, and has an extremely long finish. It should pair well with steak, beef tenderloin and lamb loin. Joseph Phelps founded his eponymous winery in Spring Valley, east of St. Helena, in 1972, and still lives on the property. The Vineyard produces from 65,000 to 80,000 cases annually with 90 percent of the wine produced from estate-owned vineyards.